Mail & Package Services is a fully-operational Postal Contract Station, capable of services equivalent to that of a U.S. Post Office. Packages are shipped and received through the United States Postal Service. Please be sure to enter 6-digit index/fund number in the PDF before printing. Take a moment to familiarize yourself with our form instructions. Doing so will allow Mail & Package Services to continue serving the UNC Charlotte community quickly and effectively. Thanks! If you get mail for someone else delivered to your mail box place it in the Misdelivered/Missent mail slot (located next to the Outgoing Mail Slot). DO NOT throw misdelivered mail away; it may be important to someone, and tampering with mail that does not belong to you is a Federal offense punishable by law. If you have a permanent address change, fill out the Change of Address form, or you can pick it up at the Mail & Package Services Center. Change of Address cards must be submitted to Mail & Package Services before mail is forwarded. 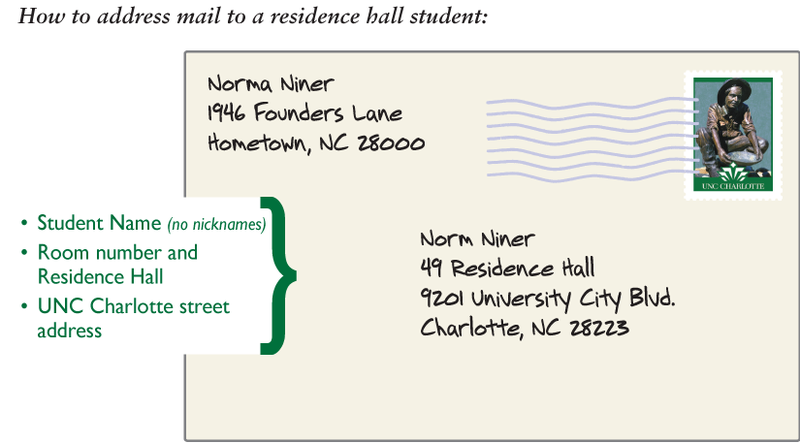 If you are trying to send mail to a Residence Hall Student, here's an example of how to address the envelope. Mail & Package Services provides residence hall box delivery service as a convenience to students as well as departmental deliveries. Screen your mailing list for unnecessary names, duplicates and incomplete addresses. Do not over-insure. USPS will pay only the actual value of an item, not the declared value. Use postcards for short messages or announcements. The cost is 33 cents instead of the letter rate of 46 cents. Double side your inserts to keep the weight down on your mail piece. Combine mailings when possible into a larger envelope for distribution at the same location. Use Business Reply envelopes provided by vendors, instead of department envelopes. FAX the information when time is crucial, instead of using Express mail. If you use Priority mail, use the envelopes and boxes provided by the USPS. These supplies are free and can be ordered on-line at USPS.com. Request Media Mail rate when mailing printed materials. Savings can be as much as 50% of the cost of 1st class mail. Call UNC Charlotte Mail & Package Services, 704-687-0383 where experienced professionals can advise you on the best ways to save postage cost. Have your Student ID and tracking number ready. Ring bell once for service. Sign your name before leaving the window. Not open on holidays when the University is closed.